Mars Global Surveyor captures a seasonal dust storm in the northern hemisphere of Mars. Planetary scientists now suggest that electrified winds on Mars may be the cause of the planet’s mysterious soil chemistry. But their understanding is clouded by a model that reverses cause and effect. A continental scale dust storm, presently clouding visibility on Mars, has provoked some new speculations on the role of “wind-generated” electricity and the ways it might affect the Martian soil. NASA scientists say that electricity could break apart carbon dioxide and water molecules in the Martian atmosphere, producing such chemicals as hydrogen peroxide (H202). These chemicals, in turn, could explain the enigmatic and contradictory results NASA obtained when the Viking landers tested the Martian soil for signs of life. Dust particles become electrified in Martian dust storms when they rub against each other as they are carried by the winds, transferring positive and negative electric charge in the same way you build up static electricity if you shuffle across a carpet. ‘From our field work, we know that strong electric fields are generated by dust storms on Earth,’ said co-author William Farrell of NASA's Goddard Space Flight Center, Greenbelt, Md. ‘Also, laboratory experiments and theoretical studies indicate that conditions in the Martian atmosphere should produce strong electric fields during dust storms there as well.’"
The problem with this model is that the tenuous Martian atmosphere isn’t substantial enough to generate such huge—and at times planet-wide—dust storms. 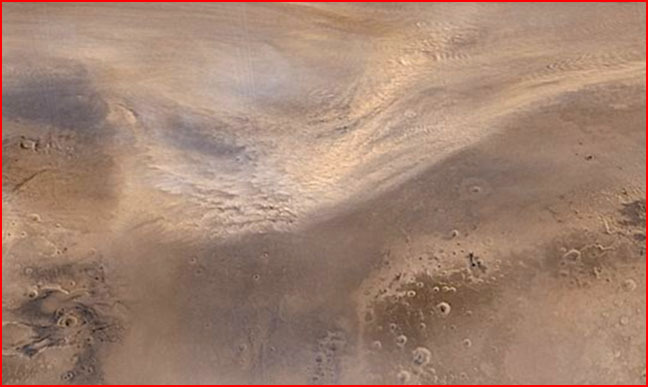 The first requirement when proposing a model of this sort is to show that the forces required for charge separation within dust clouds could occur in the near vacuum of the Martian environment. On Mars, the atmosphere is less than1% of that on earth and averages 75 degrees colder. These are not conditions conducive to the factors assumed to cause Earth’s weather (a false assumption to start with, we believe). Yet despite its atmospheric deficiency, Martian dust storms are much larger than any seen on Earth, and the planet’s fierce “dust devils” would dwarf the typical tornado on Earth. Where does the power to raise dust miles into the rarified Martian air come from? Electric Universe theorists understand that planetary weather systems are not driven only by the input of solar radiation. Seasonal changes in sunlight are incapable of accounting for the electrical component of weather on any planet, and it is certainly incapable of explaining what we observe on Mars. In the electric view planets are charged bodies that are interacting with their changing plasma environment. Hurricanes, typhoons, tornadoes, waterspouts, dust devils, and thunderstorms are all driven by electrical energy exchanges. So too, electrical fireworks in the form of lightning, blue jets, red sprites, tigers, and elves all bear witness to earth’s electrical transactions with the Sun and its domain. Putting the horse in front of the cart, it is electricity that drives the giant dust storms on Mars. Of course, this does not diminish the role of electrochemistry in altering the Martian soil, it allows for the possibility that electrical effects are considerably greater than planetary scientists have realized. It also allows for the possibility that a more electrified environment in the past, in an unstable phase of solar system history, may have altered the Martian surface to an extent NASA scientists have never imagined.